Glorious ocean views and a relaxing beach atmosphere await you on your North Myrtle Beach, South Carolina vacation at Seaward Villas. This charming North Myrtle Beach resort is just across the street from the beautiful Atlantic Ocean and just around the corner from a plethora of North Myrtle Beach shops, restaurants, golf courses and entertainment. This small North Myrtle Beach resort complex offers condominiums that sleep up to four North Myrtle Beach vacationers. Whether you are planning a romantic North Myrtle Beach getaway for two or are planning to bring the kids with you to North Myrtle Beach, Seaward Villas offers the location and amenities that you are looking for. All the comforts of home are provided at this North Myrtle Beach resort, including comfy furnishings, full kitchens and private balconies that offer you and your guests the perfect place to relax and catch up as you are surrounded by the sights and smells of the beach! Seaward Villas also offers you and your guests a sparkling swimming pool where you can frolic with your kids, get in some laps or simply relax on a raft as you bob gently in the water. Surrounding the pool is a large sun deck lined with comfy beach chairs where you can relax and work on your tan. Being so close to the ocean makes it easy for you to pack up a cooler and a beach bag and mosey down to the water and spend the day. Put up your beach umbrella and spread out your towels and enjoy all the beach fun you have been anticipating on your North Myrtle Beach vacation! 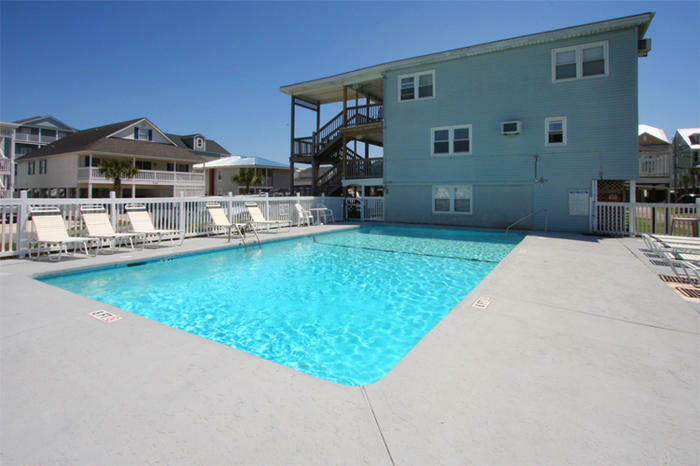 The Cherry Grove location of these North Myrtle Beach vacation rentals puts them close to the Cherry Grove Fishing Pier, which is popular with both local anglers and vacationers alike. Even if you are not a fisherman, you will enjoy the fabulous ocean views from the observation deck on the pier. Staying at Seaward Villas on your North Myrtle Beach vacation puts you in a great position to enjoy all of the things this exciting area of South Carolina has to offer. Fabulous North Myrtle Beach restaurants, outstanding shopping, championship golf courses, top-notch entertainment and more are within close proximity to these lovely North Myrtle Beach vacation rentals. A wonderful North Myrtle Beach resort that is close to the beach and all of the North Myrtle Beach excitement—this is Seaward Villas! Elliott Beach Rentals is not affiliated with onsite management or the HOA of Seaward Villas.